XenonPy has a rich set of tools for various materials informatics applications. The descriptor generator class can calculate several types of numeric descriptors from compositional, structure. By using XenonPy’s built-in visualization functions, the relationships between descriptors and target properties can be easily shown in a heatmap. 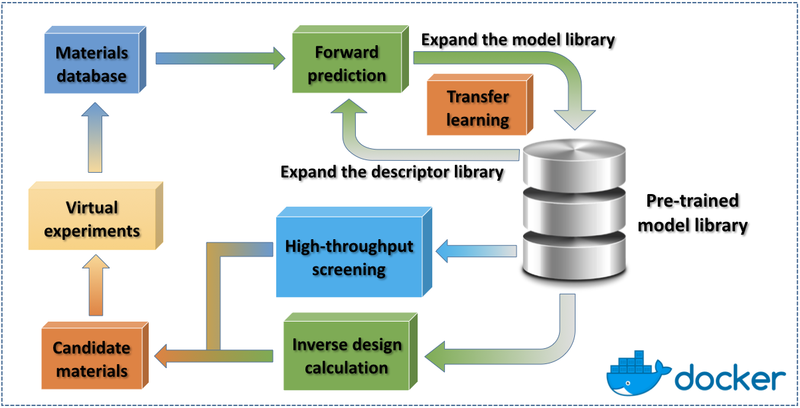 Transfer learning is an important tool for efficient application of machine learning methods to materials informatics. To facilitate the widespread use of transfer learning, we have developed a comprehensive library of pre-trained models, called XenonPy.MDL. This library provides simple API that allows users to fetch the models via a http request. For the ease of using the pre-trained models, some useful functions are also provided. Yamada, H., Liu, C., Wu, S., Koyama, Y., Ju, S., Shiomi, J., Morikawa, J., Yoshida, R. Transfer learning: a key driver of accelerating materials discovery with machine learning, in preparation. XenonPy is an open source project inspired by matminer. This project is under on-going development. We would appreciate any feedback from the users. Code contributions are also very welcomed. See Contribution guidelines for more details. © Copyright 2019, yoshida-lab Revision 4befa544.